" กรุงเทพฯ ดุจเทพสร้าง เมืองศูนย์กลางการปกครอง วัด วัง งามเรืองรอง เมืองหลวงของประเทศไทย " " สำนักงานการต่างประเทศเปิดให้บริการเว็บไซต์ เพื่อประชาสัมพันธ์ข้อมูลข่าวสารต่างๆ และ งานของสำนักงานการต่างประเทศตั้งแต่วันนี้เป็นต้นไป ยินดีให้คำปรึกษา และตอบคำถาม ข้อสงสัย ผ่านทางเว็บไซต์" " ติดตามข้อมูลอัปเดทข่าวสารล่าสุด ผ่านทางเฟสบุค ที่ https://www.facebook.com/bangkokiad "
HCM CITY – The Quarter Safeguard team for firefighting in Nguyễn Thái Bình Ward in HCM City’s District 1 is often called for help by locals. The team has mini fire vehicles than can enter narrow alleys, and has helped put out dozens of fires since 2009 when it was first set up. The vehicles are self-modified into mini fire engines, an initiative by Lý Nhơn Thành, the team’s head. In 2002 Thành was one of first to rush to the rescue when the blaze broke out at the International Trade Centre in District 1. The fire claimed 60 lives, but he said he saved 97 people. “How painful and unhappy it was to see the bodies of adults and children being brought out of fires,” he says, explaining that after that disaster he wanted to do something. He also saw fires in alleys so narrow that fire engines could not enter them. During those times he would think a smaller vehicle could be useful in saving lives and property. 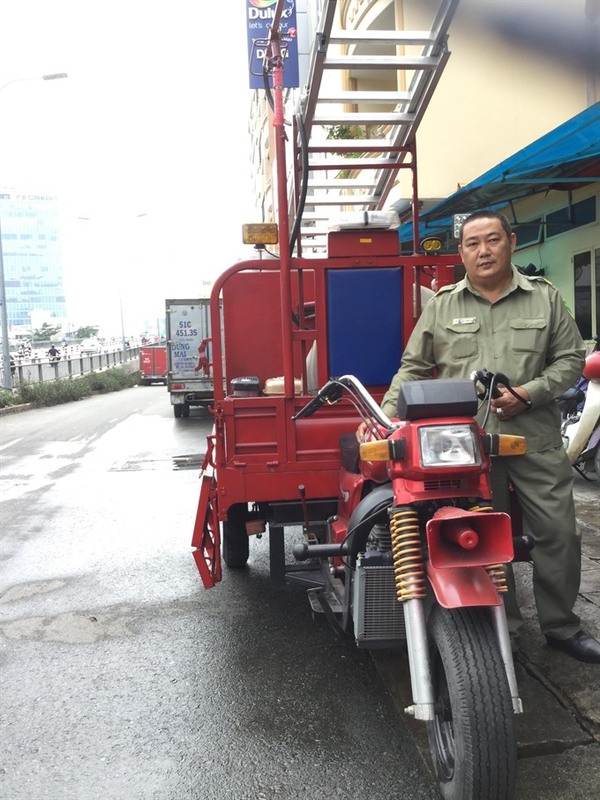 He bought an old motorbike and other equipment such as a small water pumping machine based on the advice of firefighters at the district Fire Prevention and Fighting Police Division. In October 2009 the first firefighting motorbike was ready for use. It easily entered small alleys and helped put out 14 fires in the next few years. In 2016 he got a loan to buy a three-wheel vehicle which was later installed with a 1,300-litre water tank, a small water pumping machine, a ladder, a hose, and other equipment. “The vehicle, only 1.3m wide and 1.8m long, very easily reaches fires in houses inside long, narrow alleys,” Thành says. A year after he fabricated the vehicle, he was contacted by overseas Vietnamese from a company supplying technologies to treat environmental disasters and they donated foam extinguishing agent F500, which stamps out fires rapidly. “The agent especially renders toxic smoke discharged by fires non-toxic. It is very important because many people die due to toxic smoke,” Thành says. Last year he borrowed again to buy a motorbike for carrying a 400hp water pumping machine also donated by the same overseas Vietnamese. He himself fabricated a device to connect the pump with fire hydrants on streets to spray water on fires. These mini firefighting vehicles were used recently to put out a fire aboard a bus on Ông Lãnh Bridge in District 1. Thành says he hopes never to use his equipment to extinguish fires because he just does not want a fire to break out. His team is of great assistance to the fire brigade in reducing the loss of life and property in fires in the district. Thành has been honoured for his services. His mini fire engine won the third prize in a contest last year called Community’s Ideas for innovative technology ideas, products and solutions. The annual contest is organised by Khám Phá (Discovery) magazine and the city Department of Science and Technology’s grassroots level science management division. Bùi Văn Quyền, vice chairman of the Việt Nam Invention Association, hailed Thành’s initiative for its high practicability. Thành’s team’s brief is to maintain social order and regulate traffic on the streets. He has personally helped catch thieves. People in his ward say he is friendly and takes particular care of poor people. He even helped a poor woman buy a vehicle to hawk coffee to earn money so that her son could go to university.